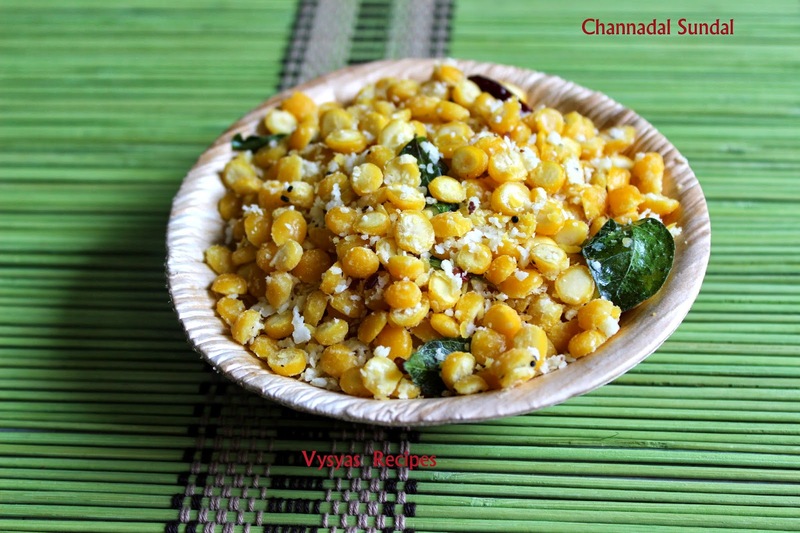 Channa dal Sundal is a simple, Easy Navartri Sundal Recipe. It is one of the healthy and filling recipe packed with proteins. it is also had as an evening snack.Adding Ginger, gives nice aroma to sundal. Now we learn to make chanadal sundal. Soak the channadal with 1 + 1/2 cups of water, for 1 hour and pressure cook it for 2 whistles, till soft not mushy or you can also cook in a pan with needed water,till soft. drain the water, and keep it aside. Heat the oil, add mustard seeds, when it splutters, add urad dal,ginger, red chilly(broken),Green chilly(chopped), and curry leaves. Saute till dal's turns Golden brown colour, the add cooked channadal and salt. Saute till moisture goes off, then add Grated coconut. Saute for one or two minutes, till everything combines.Now channadal sundal is ready to serve. Navarathiri recipes pottu kalkkutheenga.sundal asathalaka irukku.